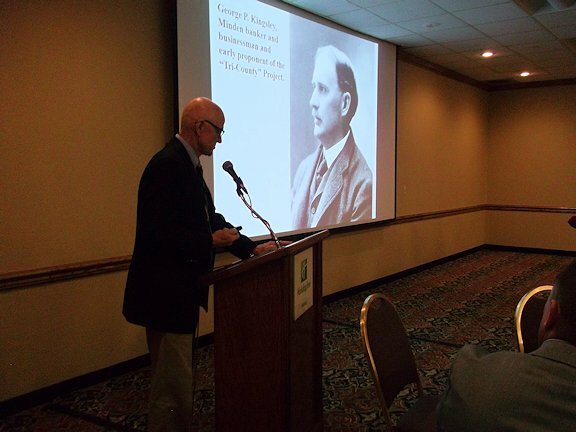 “Forward … Building on the Past,” was the theme of the Nebraska State Irrigation Association and the Nebraska Water Resources Association annual joint convention held Nov. 21-22 in Kearney, Neb. The convention featured two days of presentations and discussions based on that theme. The event’s first presentation covered the historic 1935 flood along the Republican River that caused untold damage and claimed more than 100 lives. The catastrophe led to the construction of a series of dams and reservoirs in the Republican River Basin to control the river flow to prevent future floods, for agriculture irrigation, and recreational uses. Also on the agenda was a panel discussion with several recently retired individuals who shared their perspectives on long careers in the water resources field, experience gained, lessons learned, and advice for the future. On the panel were Glenn Johnson, former Lower Platte South NRD manager; John Turnbull, retired manager of the Upper Big Blue NRD; Gary Westphal, former manager of the Butler Public Power District; and Jim Goeke, formerly with the UNL Conservation and Survey Division. Looking to the present and future, several presentations covered topics related to water management, integrated management planning, managing drought risk, the Platte River Cooperative Agreement, and expanded efforts by the Nebraska Water Balance Alliance. CNPPID General Manager Don Kraus gave a presentation entitled, “Celebrating the 75th Anniversary of Nebraska’s Largest Water Management Project.” Kraus’ presentation covered the events leading up to the formation of The Central Nebraska Public Power and Irrigation District, the construction of Kingsley Dam and the rest of Central’s hydro-irrigation project, and Central’s efforts to modernize its facilities, improve operational efficiency and conserve water resources over the decades. After dinner on the evening of Nov. 21, Kraus presented the Groundwater Foundation’s Maurice Kremer Groundwater Achievement Award to former State Senator Tom Carlson. Former State Senator Tom Carlson (second from right) received the Kremer Award at the NSIA/NWRA Annual Convention. 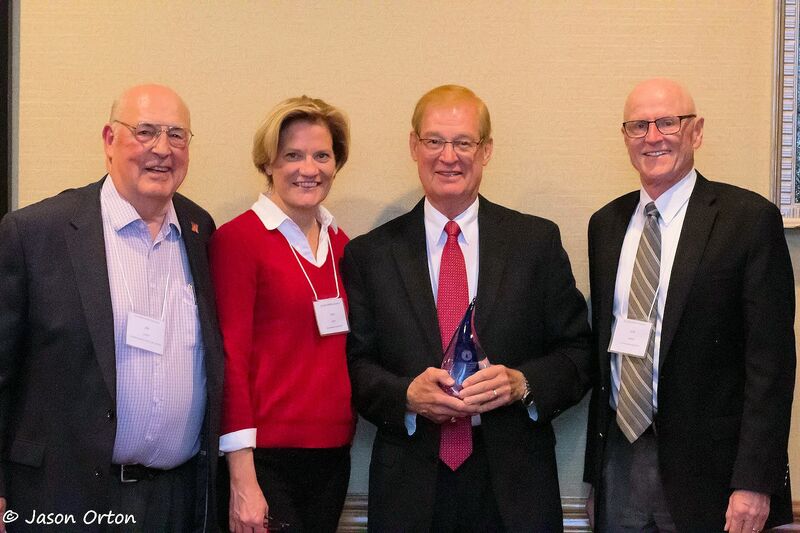 Shown with Sen. Carlson (left to right) are Jim Goeke, selection committee member; Groundwater Foundation Executive Director Jane Griffin; and Don Kraus, selection committee member. The Kremer Award is presented annually by Foundation to an outstanding Nebraskan who has made a substantive contribution to the conservation and protection of Nebraska’s groundwater. The Groundwater Foundation is a nonprofit organization based in Lincoln with a mission to educate people and inspire action to ensure sustainable, clean groundwater for future generations. Senator Carlson actively sponsored and championed LB 1098, which established the Water Sustainability Fund in 2014 to guarantee a future for Nebraska’s stressed water resources. Through his efforts, almost $30 million dollars were accumulated to finance water sustainability research in Nebraska in 2015/2016 and will finance water sustainability research into the future. He also worked on legislation related to the Republican River Sustainability Task Force and the extension of funding for the Riparian Vegetation Management Task Force. Carlson was elected to the Nebraska Legislature in 2006 from District 38. As a State Senator, he chaired the Agriculture Committee from 2009 through 2012 and the Natural Resources Committee in 2013 and 2014, and worked extensively on agriculture and water issues.